The Bush “administration” has approved increased drilling in Montana. The decision would allow 18,000 natural gas wells to be drilled on more than 1.5 million acres of federal land in the Powder River Basin in southeastern Montana over the next two decades. Yes, the drilling boom in the West remains stuck in high gear. Despite a dramatic increase in the number of wells for oil and gas in the past 8 years, prices haven’t decreased for consumers. During the same time period, oil and gas corporations’ profits have increased quarter after quarter, year after year. The drilling is solely benefiting corporations while Western residents deal with increases in crime and pollution. Moreover, the heightened pace of industry is taking a toll on local infrastructure – roads, water, sewage and the like. Has the fossil fuel industry paid for the increased wear-and-tear of public infrastructure? No. They’ve been handed corporate welfare in giveaways by the Bush “administration”. The Powder River Basin holds a type of natural gas known as coal-bed methane, which companies can extract only after pumping vast quantities of water from underground aquifers that trap the gas. That’s the same water ranchers in the arid region depend on to irrigate fields and fill stock ponds. That means the corporations padding the pockets of Republican politicians are going to compete for the same resources as the voters those Republicans depend on. The word is the fossil fuel corporations won’t keep drilling if environmental concerns arise. This might be likelier under an Obama administration than a Bush “administration”, but I say wait until the concerns arise to see how it’s handled. We’ve been reassured that drilling has such incredible technologies that the environment is basically left untouched for years by pro-Bushies. The environment always suffers, the fossil fuel industry always profits and nothing is cleaned up by the corporations doing the damage – it always falls to taxpayers who didn’t get a profit from the drilling. That kind of socialism is alright for Republicans – privatize the profit, socialize the loss. This kind of plan is incredibly short-sighted. As climate change makes its influence felt in the Western U.S., steady precipitation is forecasted to decrease. While that’s going on, burning more natural gas will generate even more greenhouse gases whose effect won’t be felt for decades. Mitigating those effects will become increasingly expensive, by the way. So the climate in the Western U.S. will be forced toward increasingly arid conditions while additional drilling continues, which will require millions of gallons of water from ranchers and other Western interests. All while drilling corporations privatize the profits and socialize their losses. On the other hand, we could install wind farms and new transmission lines, which wouldn’t release nearly the GHGs drilling does during manufacture and assembly and wouldn’t compete for water like drilling will. Americans would get clean energy and the climate and wildlife wouldn’t be as impacted. I can’t wait until Jan. 20th and our energy nightmare is addressed more honestly. Categories: business, energy, global warming | Tags: BLM, climate change, gas drilling, global warming, oil drilling, Powder River Basin, socialized losses, water pollution | Permalink. I remember the good old days of Republican-led bipartisanship. The days when every Republican leader in the House, Senate, White House and all their mouthpieces in media outlets (TV, radio and print) were screaming that Democrats had to play nice and allow up-or-down votes on President Bush’s nominees for federal positions including Attorney General, Supreme Court Justices and the like. They made the point daily that Bush wouldn’t have nominated anyone not qualified for their positions (disproved time and time again) and it was in the best interest of all Americans if no hearings or debate were held over the nominees. Do you remember those awesome, bipartisan days too? Good, because those days have met a swift death now that Republicans are part of severe minorities in the House and Senate. They had the opportunity before them to put the uber-polarized days of President Bush behind them. They had the chance to work with the incoming Obama administration, not against it, in ensuring Americans have personnel in place quickly. Not surprisingly, they’ve chosen to continue their hyper-partisan ways. The Cons want to continue to be hypocrites in every way by promising Americans a bruising nomination process over Eric Holder, President-elect Obama’s nominee for Attorney General. The confirmation hearing for Eric Holder, Obama’s pick for attorney general, promises to be bruising, with Republicans determined to explore Holder’s role in controversial pardons under President Clinton, his views on gun rights, and his involvement in the case of Elian Gonzalez, the 6-year-old Cuban boy returned to his homeland by Clinton’s Justice Department. Really? With the worst economy since the Great Depression, record foreclosures, rising unemployment, the occupation of Iraq costing taxpayers billions per week, a wrecked military, climate tipping points being passed, a drowned region forgotten and millions of more Americans without quality health care or education, Senate Republicans want to focus on Holder’s views on gun rights and his involvement with a single child some 10 years ago. The American public resoundingly voted against the Cons’ antics. More than a few vile campaigners lost badly this year. The Republicans have been left as a regional party of the South. Apparently, that’s not enough for them. They want to continue focusing on their extremist agenda and trying to distract Americans from the real issues they face every day. The Cons will not back down an inch from their agenda. That’s not compromise and it’s not bipartisan. Like I expected anything else from them. Categories: media, politics | Tags: Attorney General, bipartisanship, Cons, Eric Holder, President Obama nominee | Permalink. The Cons’ dream of shutting down public education is being pursued in Colorado. In one of the more short-sighted attempts at a solution possible, state Rep. Don Marostica of the Joint Budget Committee posed a question this week in a lengthy questionnaire to the state’s public colleges and universities: how would they survive if they received no dollars from the state legislature? The answer is easy: they wouldn’t. Got that? After the largest failure of enterprise in world history this year, Cons continue to push their failed ideology everywhere they can. No recommendations to stop giving away tax dollars to the fossil fuel industry. No recommendations to stop giving away tax dollars to social programs that have been shown to not work. No, the Cons recommend that tax dollars be withheld from colleges and universities. At the end of the day, it’s all about tax dollars isn’t it? The Cons will never advocate to increase investments in communities. Despite evidence to the contrary, they continue to believe they’re islands and self-made people. They’re going to wreck Colorado and the U.S. even more than they already have since they’ll never stop praying to their false free-market gods. Colorado Cons will push another part of their extremist agenda when the legislature convens next month: State Sen. Scott Renfroe will carry a bill that would require voters to present photo identification at the polls to vote. Renfroe said the bill would safeguard elections. This is another solution in search of a problem. How many people voted illegally this year? I can’t find a single case of it occurring. Meanwhile, millions of Coloradans are non- or under-insured (receiving sub-standard health care), thousands of Colorado children live in poverty, too many Coloradans drop out of school and too many Coloradans are in prison for petty offenses like marijuana posession (these are predominantly minority Coloradans, despite equal rates of possession as whites). Those are real problems that desperately need real solutions. Enacting laws like Renfroe’s would ensure fewer people vote, making Con ballot box victories more likely. Here is why the Cons are in the minority party in Colorado: they only represent extremist views. They want more diseased Coloradans, less educated Coloradans and fewer people voting. Instead of changing their policy positions even slightly, they want to prevent people from voting and keeping their elected officials accountable. Categories: education, health care, politics | Permalink. President Bush and his supporters have been busier the past nine months trying to establish the foundation of his “legacy” than running the government. Not that they were doing a good job of running the government before – they’ve never done that. But, “the legacy” has been at the forefront of their efforts for some time. Well, news came out today that has more to do with his legacy than anything his supporters have come up with. What legacy am I referring to? How about the pro-corporatist judicial legacy Bush is leaving behind? 10, 20 and 30 years from now, judges Bush put on benches will still be ruling over cases. When you look at the number of right-wing, Federalist Society-type judges Bush appointed, it becomes apparent that the rest of us will be forced to deal with his failed ideology long after he is gone. The news today dealt with an attempt to put together a class-action lawsuit against trailer manufacturers post-Katrina. Those trailers are alleged to have been of such poor quality that they actually posed health risks to their occupants. Bush’s government issued those trailers and was responsible for ensuring they were of sufficient quality to house human beings safely. U.S. District Judge Kurt Engelhardt ruled that the lawsuits could not be brought forward in a class-action due to the number of different manufacturers, and because each person’s claim is unique and must be examined individually. In actuality, I wonder how much easier it is for corporations to swat away individual lawsuits. Corporations have deeper pockets and more resources than individuals do. Pooled resources by plaintiffs could be important in a case like this, especially considering the financial status of those forced into trailer housing following Hurricane Katrina. Engelhardt was appointed to his current position by Bush back in 2001. I’ve long known that Bush appointed a very narrow kind of person to benches at all levels. Those judges had to be ideologically pure to Bush, Karl Rove and others. The liklier the judges were to hold pro-corporate and anti-citizen positions, the liklier they were to be nominated to higher benches. Engelhardt’s ruling is likely to be only the first in a long string of decisions surrounding Bush’s criminal response to a natural disaster. This ruling isn’t friendly toward living, breathing American citizens. Unfortunately, I expect similar decisions against them in the future. Categories: framing, politics | Tags: FEMA trailers, George Bush legacy, Hurricane Katrina, right-wing judges, U.S. District Judge Kurt Engelhardt | Permalink. Just about the only tangible action that came out of the Poznan Climate Conference was the announcement that poor countries would receive a few million dollars to begin financing projects to deal with climate change. $60 million might sound like a lot of money, but it will be a drop in the bucket of funds necessary if GHGs are allowed to increase at today’s rates much longer. The UK’s Independent asks if recent Arctic ice and temperature anomalies are indicative of a tipping point having been passed, as I alluded to in my last State of the Arctic post. “Ski industry officials know that warming is real, and that small changes in climate have substantial effects on ski areas,” said Williams, also a fellow at CU-Boulder’s Institute of Arctic and Alpine research. I’ve written a little bit about areal extent of Arctic sea ice. Of more importance is what the condition of Arctic sea ice volume is. Well, the news isn’t good this year: a lot of ice volume was lost in the past year. Categories: business, global warming | Tags: climate change, global warming, Poznan conference | Permalink. This picture shows another reason why the rapid growth of new ice has stalled: there is much less space to expand to than there was in October. The area between Greenland and Scandinavia and Greenland and Canada will of course see additional ice growth. The ice will also grow into the Pacific south of Alaska and Russia. But those regions contain less area than the area that saw refreezing in October. With the passing of the Winter Solstice, the sun will begin shining over more area in the Northern Hemisphere every day again through June. 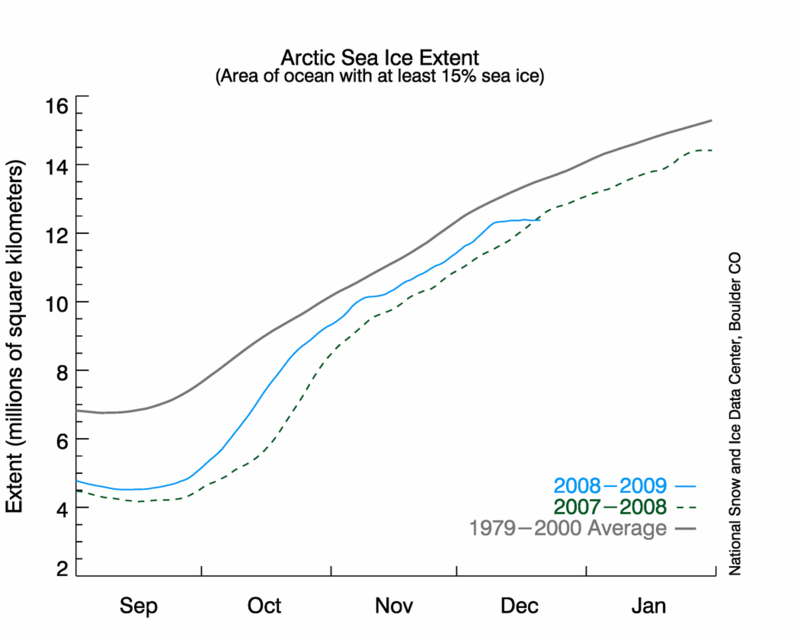 The Arctic ice sheet will likely grow through March before remelting again next year. 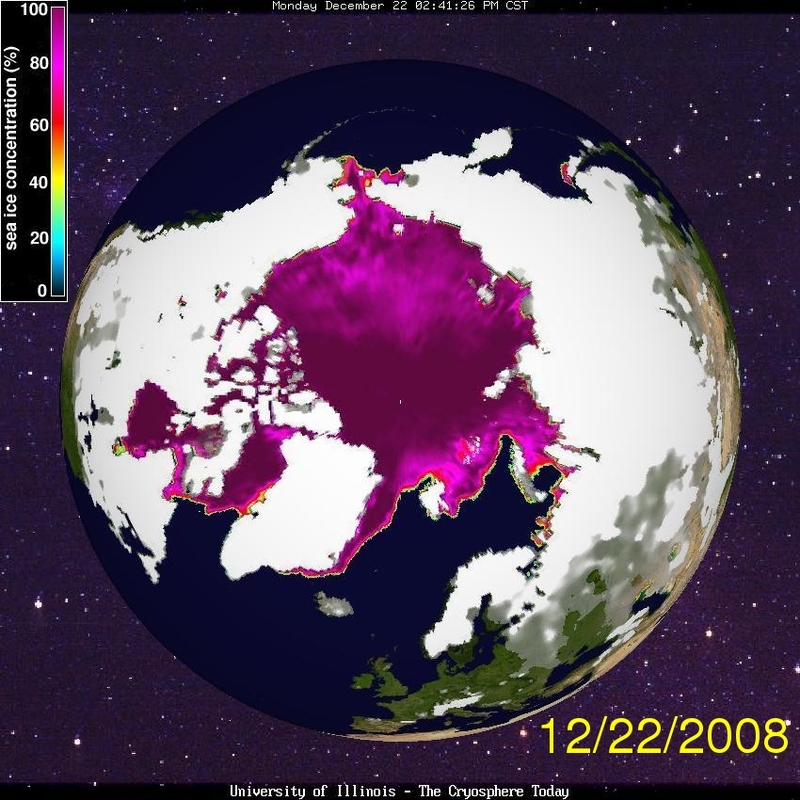 What will the maximum extent of ice in 2008-09 be? The long-term health of ice sheets and glaciers is not good in the face of multi-degree positive temperature anomalies. billlaurelMD posted a similar diary at a later date – the graph in his diary demonstrates that the phenonema described above have continued. Categories: global warming, NASA, science | Tags: Arctic ice sheet, climate change, global warming, National Snow and Ice Data Center | Permalink. Two pieces of news came out today that are important for climate, climate policy and energy policy. I’ll start with the good news. President-elect Obama has selected Harvard University physicist John Holdren as presidential science adviser and Oregon State University marine biologist Jane Lubchenco as head of the National Oceanic and Atmospheric Administration. This is good news on multiple levels. First, it’s important to note that more scientists are joining Obama’s administration. The last 8 years have seen a seriously disturbing lack of people with scientific backgrounds in charge of science policy. Most Americans would agree at this time that this approach has been the wrong approach. Second, both Holdren and Lubchenco have argued repeatedly for a mandatory limit on greenhouse gas emissions to avert catastrophic climate change. The debate on the cause is over. What’s left is to determine what series of solutions to employ about it. Holdren and Lubchenco understand the real dangers the planet faces and are prepared today to act. Delayers would wait until they drowned in the rising sea levels, holding onto their ideology with every ounce of faith they could muster. Thankfully, the delayers lost in the elections last month. More on this topic can be found below the fold. I’m going to put the piece of bad news above the fold. Ugh. Now the piece of bad news. President Bush is spending the waning days of his pathetic presidency setting up regulations that are in direct contradiction to President-elect Obama’s (Americans, really) stated goals moving forward. Yes it’s true that this has become a reality of presidents leaving office. But as usual, the Bush is working overtime to set a record for the number of regulations they’ll implement after the election and with enough time to spare to ensure it will take months or years to overturn them. The specific regulation I’m speaking of is the following: Bush is trying to make sure that federal air pollution regulations will not be used to control the gases blamed for global warming. In a memorandum sent Thursday, outgoing Environmental Protection Agency Administrator Stephen Johnson sets an agency-wide policy prohibiting controls on carbon dioxide emissions from being included in air pollution permits for coal-fired power plants and other facilities. Did you get that? The public has an interest in how CO2 emissions are regulated, but the Bush administration will allow them no voice whatsoever in deciding how those regulations should be clarified. The administration is quite simply locking the world onto its current course toward catastrophic climate change because … they can. This seems to me to hold more weight than the two excellent choices President-elect Obama announced. The Obama administration will face non-trivial obstacles to implementing their policies. Energy and climate policies need to undergo a radical shift the day Obama is sworn in. We have no more time to give this issue. When under-informed Americans wonder why Obama isn’t doing anything about climate change, this kind of under-the-radar politics won’t be brought up. Categories: energy, global warming, politics, science | Permalink.